Please provide the details requested below. At the University of West Georgia, we transform lives and change perceptions, constantly challenging ourselves to ask "What if?" and refusing to accept that possibilities are limited. We embrace diversity. We value community. We drive growth. We engage — as students, faculty, and staff — and work collectively to be the best comprehensive university in America, sought after as the best place to work, learn and succeed. This is the land of opportunity and discovery. If you ask us, the stars shine just a little brighter here — in the sky and among us. One thing's for sure: Everything changes when you Go West. We invite you to visit our beautiful 645+ acre campus for a student led walking tour. Prospective students and their families will gain information about Admissions, Financial Aid/Scholarships, Residence Life, and Student Activities. While on campus we want to make the most of your trip! Please let us know if you would like us to make any additional appointments with other areas of campus (Please note, these are not guaranteed appointments and are based on availability). Each tour includes an opportunity to attend an information session. Please arrive at least 15 minutes early for check in and parking. You've probably started thinking about the kind of college you want to attend — and how the right university can help you find your path to success. Go West — It Changes Everything! Carrollton is a great home base for your West adventures. Check out Adamson Square for Restaurants, coffee shops, art galleries, music and shopping. The city hosts festivals and seasonal events as well (you won't want to miss UWG's Homecoming Pep Rally on the Square!). The Cultural Arts Center showcases theatre and art events. There's a brand new amphitheater, too, ready to amp up concerts and performances downtown. And there are thousands of acres of lakes, parks, and hiking trails to explore. When you want to expand your horizons to a big city skyline, Atlanta is just an hour away. 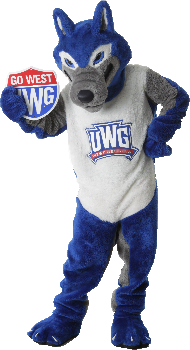 The mission of UWG's Office of Undergraduate Admissions is to enroll a diverse and qualified body of students through intentional and caring service, effective communications, successful recruitment techniques, and efficient operations, all delivered by our knowledgeable and engaged employees to promote a transformational experience and student fit within the University.